Another all too frequent grain bin accident is putting the spotlight on grain bin safety. Thiry-year-old Brandon Mullen got trapped Tuesday afternoon. His body was pulled out about an hour and a half later, when rescue crews cut holes on the side of the bin. The National Education Center for Agriculture Safety travels around the country talking about why grain bins are so dangerous and how farmers can protect themselves. Dan Neenan travels with an interactive grain bin on the back of his truck to do demonstration. He says there’s four reasons why people get trapped in grain bins. One is air pockets form while the top crusts over, so stay along the sides. Two comes when grain clumps up around the side. Three comes with technology, just like texting and driving, texting and using a grain vacuum can be dangerous. The most dangerous one is when the auger is running. He says most grain bin deaths happen because people don’t turn it off before getting in. “What it does is it drains grain straight down from the middle which causes it to cone in so if somebody is in there with that auger running they’re going to get pulled down to the middle of the bin,” says Dan Neenan. Also remember this is a two person job, one in the bin, one outside just in case something goes wrong. The person in the bin should always wear a harness so they don’t get sucked down deep and if grain does pour over them, they can be found. OSHA has developed this webpage to provide workers, employers, and safety and health professionals useful, up-to-date safety and health information on grain handling facilities. Grain handling facilities are facilities that may receive, handle, store, process and ship bulk raw agricultural commodities such as (but not limited to) corn, wheat, oats, barley, sunflower seeds, and soybeans. Grain handling facilities include grain elevators, feed mills, flour mills, rice mills, dust pelletizing plants, dry corn mills, facilities with soybean flaking operations, and facilities with dry grinding operations of soycake. Suffocation is a leading cause of death in grain storage bins. In 2010, 51 workers were engulfed by grain stored in bins, and 26 died—the highest number on record, according to a report issued by Purdue University [193 KB PDF, 5 pages]. 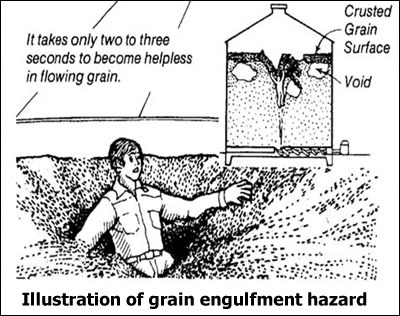 Suffocation can occur when a worker becomes buried (engulfed) by grain as they walk on moving grain or attempt to clear grain built up on the inside of a bin. Moving grain acts like “quicksand” and can bury a worker in seconds. “Bridged” grain and vertical piles of stored grain can also collapse unexpectedly if a worker stands on or near it. The behavior and weight of the grain make it extremely difficult for a worker to get out of it without assistance. 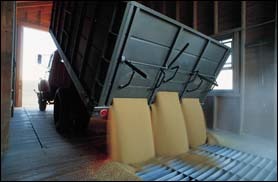 OSHA has sent notification letters to approximately 13,000 grain elevator operators warning the employers to not allow workers to enter grain storage facilities without proper equipment, precautions (such as turning off and locking/tagging out all equipment used so that the grain is no being emptied or moving into the bin) and training. Falls from height can occur from many walking/working surfaces throughout a grain handling facility. Examples of such surfaces include (but are not limited to) floors, machinery, structures, roofs, skylights, unguarded holes, wall and floor openings, ladders, unguarded catwalks, platforms and manlifts. Falls can also occur as workers move from the vertical exterior ladders on grain bins to the bin roof or through a bin entrance. Mechanical equipment within grain storage structures, such as augers and conveyors, present serious entanglement and amputation hazards. Workers can easily get their limbs caught in improperly guarded moving parts of such mechanical equipment. Storage structures can also develop hazardous atmospheres due to gases given off from spoiling grain or fumigation. Workers may be exposed to unhealthy levels of airborne contaminants, including molds, chemical fumigants (toxic chemicals), and gases associated with decaying and fermenting silage. Fumigants are commonly used for insect control on stored grain and many have inadequate warning properties. Exposure to fumigants may cause permanent central nervous system damage, heart and vascular disease, and lung edema as well as cancer. These gases may result in a worker passing out and falling into the grain, thus becoming engulfed and suffocating or otherwise injuring themselves. What can be done to reduce the hazards in grain handling facilities? On August 4, 2010 and again on February 1, 2011, OSHA issued warning letters to the grain handling industry following a series of incidents including the recent suffocation of 2 teenagers in Illinois grain elevator. In response to the rising number of workers entrapped and killed in grain storage facilities, OSHA has also issued a new fact sheet, Worker Entry Into Grain Storage Bins [1 MB PDF*, 2 pages] in August 2010 for workers and employers emphasizing the hazards of grain storage bin entry and the safe procedures that all employers must follow. Additionally, OSHA issued a safety and health information bulletin (SHIB) entitled, Combustible Dust in Industry: Preventing and Mitigating the Effects of Fire and Explosions, and a Hazard Alert: Combustible Dust Explosions [790 KB PDF*, 2 pages] fact sheet. The control of worker’s exposure to hazards in grain handling facilities are addressed in the OSHA standard for grain handling facilities (29 CFR 1910.272), as well as in other general industry standards. These standards reduce the risk to workers by requiring that employers follow established, common sense safety practices when working in grain handling facilities. Turn off and lock out all powered equipment associated with the bin, including augers used to help move the grain, so that the grain is not being emptied or moving out or into the bin. Standing on moving grain is deadly; the grain can act like “quicksand” and bury a worker in seconds. Moving grain out of a bin while a worker is in the bin creates a suction that can pull the workers into the grain in seconds. Develop and implement a written housekeeping program with instructions to reduce dust accumulations on ledges, floors, equipment and other exposed surfaces. Identify “priority” housekeeping areas in grain elevators. The “priority” housekeeping areas include floor areas within 35 feet of inside bucket elevators, floors of enclosed areas containing grinding equipment and floors of enclosed areas containing grain dryers located inside the facility. Dust accumulations in these priority housekeeping areas shall not exceed 1/8th inch. Employers should make every effort to minimize dust accumulations on exposed surfaces since dust is the fuel for a fire or explosion, and it is recognized that a 1/8 inch dust accumulation is more than enough to fuel such occurrences. Inside bucket elevators can undergo primary explosions. OSHA’s grain handling standard requires that belts for these bucket elevators purchased after March 30, 1988 are conductive and have a surface electrical resistance not exceeding 300 megohms. Bucket elevators must have an opening to the head pulley section and boot section to allow for inspection, maintenance, and cleaning. Bearings must be mounted externally to the leg casing or the employer must provide vibration, temperature, or other monitoring of the conditions of the bearings if the bearings are mounted inside or partially inside the leg casing. These bucket elevators must be equipped with a motion detection device which will shut-down the elevator when the belt speed is reduced by no more than 20% of the normal operating speed. Implement a preventative maintenance program with regularly scheduled inspections for mechanical and safety control equipment, which may include heat producing equipment such as motors, bearings, belts etc. Preventive maintenance is critical to controlling ignition sources. The use of vibration detection methods, heat sensitive tape or other heat detection methods can help in the implementation of the program. Minimize ignition sources through controlling hot work (electric or gas welding, cutting, brazing or similar flame producing operations). Install wiring and electrical equipment suitable for hazardous locations. Design and properly locate dust collection systems to minimize explosion hazards. All filter collectors installed after March 1988 shall be located outside the facility or located in an area inside the facility protected by an explosion suppression system or located in an area that is separated from other areas by construction having at least a one hour fire resistance rating and which is located next to an exterior wall vented to the outside. Install an effective means of removing ferrous material from grain streams so that such material does not enter equipment such as hammer mills, grinders and pulverizers. 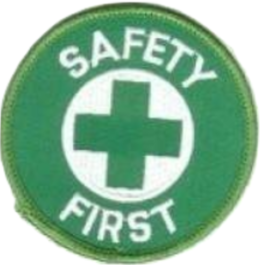 For more information, see OSHA standard (29 CFR 1910.272). Significant chapters from the report on the explosion of the DeBruce Grain Elevator that occurred June 8, 1998 Wichita, KS. This report was submitted by the Grain Elevator Explosion Investigation Team (GEEIT) and explains the investigation and cause of the explosion that killed 7 and injured 10 employees. For other valuable worker protection information, such as Workers’ Rights, Employer Responsibilities and other services OSHA offers, read OSHA’s Workers page or OSHA’s Small Business page. ‹ PreviousNew! “Dumb Ways To Die” Safety Game! Now Available For iPhone, iPad! Yes, I agree. And, they are happening more frequently. Farmers and grain handlers are in dire need of training in confined space and lock out – tag out. And you know I’ll do my part to get the word out. Thanks for commenting its always good to see you stop by! So preventable! Your work to share safety information can save lives. Have a good weekend too and I will continue my support for you! You Rock! What were the legal consequences of non-compliance for the grain bin entrapment? Don’t know yet until the State and OSHA do their respective investigations. But I’m sure there will be fines levied and lack of proper confined space training and harness use, etc.. will also be part of the citations. Unfortunately, none of them will bring this young man back.